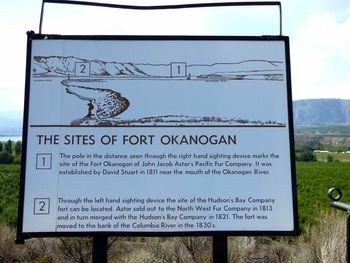 Fort Okanogan (1811-1860) - Established as a Pacific Fur Company trading post in 1811. Reestablished as a North West Company post and in 1821 became a Hudson's Bay Company post. Located in present day Okanogan County, Washington. 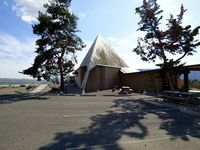 Originally a 16' x 20' log trading post located at the confluence of the Okanogan River and the Columbia River. The post was abandoned after the War of 1812 and re-established by the North West Company and served as the southern terminus of their overland Pacific brigade trail to Fort Alexandria in Canada. The North West Company merged with the Hudson's Bay Company in 1821 and the post became a Hudson's Bay Company post. The fort was rebuilt in 1830 less than a mile away from the original location. The fort was completely abandoned in 1860. 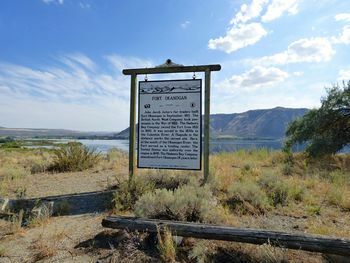 Another marker is located further west off of US 97 just across the Okanogan River on a bluff overlooking both sites. This marker is adjacent to an apple orchard and a bit hidden away. Take a left as you enter the orchard road and that leads to the bluff. A spectacular view! Location: Fort Okanogan State Park, Okanogan County, Washington. Fort map points are approximate.